THE Irish Government’s Finance Bill 2009 abandons the hundreds of thousands of working families who drove the economy through the Celtic Tiger years. So says Sinn Féin Economics Spokesperson Arthur Morgan TD. Speaking in the Dáil on Wednesday, Morgan criticised the Government’s handling of the economic crisis and said they have failed to protect the vulnerable and are penalising rather than rewarding working families. 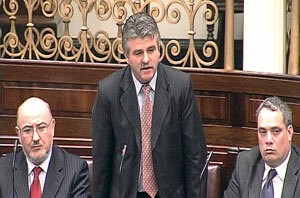 “The Finance Bill represents depressing evidence of a government continuing to sleepwalk through a crisis that is threatening not just the banking system or the construction sector but is slowly bleeding the small businesses that employ most Irish workers and which is the heart of the Irish economy”, Morgan said. He said hundreds of thousands of working families, whose effort drove the economy through the Celtic Tiger years, have all but been abandoned in the bill, condemned to endure higher taxes and more stealth charges, all to fund “policies of failure”. Morgan said the government had failed on income tax, VAT, tax exile status, reforming tax relief and tackling tax fraud. “They have failed to protect the vulnerable and most importantly in terms of ensuring economic growth they are penalising rather than rewarding working families, and there is nothing in this bill to incentivise or stimulate enterprise”, he said. Sinn Féin had proposed increasing the PAYE tax credit by 5% so those on low incomes would get some respite from higher energy costs, mortgages and food prices. This bill leaves the personal credits unchanged and only widens the 20% tax band marginally. Morgan said the 1% income levy on workers who earn more than €18,305 will damage low income families and said the levy should apply only on incomes in excess of €38,000 and that 3% levy should apply on incomes in excess of €200,100. He said Sinn Féin’s proposal to remove the PRSI ceiling would have had the double effect of raising much needed tax revenue while cushioning those on low and middle incomes from the worst effects of the increase. Welcoming the ending of the ‘Cinderella clause for tax exiles’, he wondered at the minister’s claim that tougher restrictions could not be placed on Irish tax exiles because of double taxation agreements. Are we really to believe that the minister cannot act? He can raise taxes on a whim, he can write a blank cheque for banking, but he cannot act on a handful of supposed Irish citizens who do not want to pay tax here but demand to enjoy the benefits of Irish citizenship”, Morgan said.